A Tiled map supports various sorts of content, and this content is organized into various different layers. The most common layers are the Tile Layer and the Object Layer. There is also an Image Layer for including simple foreground or background graphics. The order of the layers determines the rendering order of your content. Layers can be hidden, made only partially visible and can be locked. Layers also have an offset, which can be used to position them independently of each other, for example to fake depth. The eye and lock icon toggle the visibility and locked state of a layer respectively. You use Group Layers to organize the layers into a hierarchy. This makes it more comfortable to work with a large amount of layers. Tile layers provide an efficient way of storing a large area filled with tile data. The data is a simple array of tile references and as such no additional information can be stored for each location. The only extra information stored are a few flags, that allow tile graphics to be flipped vertically, horizontally or anti-diagonally (to support rotation in 90-degree increments). The information needed to render each tile layer is stored with the map, which specifies the position and rendering order of the tiles based on the orientation and various other properties. Despite only being able to refer to tiles, tile layers can also be useful for defining various bits of non-graphical information in your level. Collision information can often be conveyed using a special tileset, and any kind of object that does not need custom properties and is always aligned to the grid can also be placed on a tile layer. All objects can be named, in which case their name will show up in a label above them (by default only for selected objects). Objects can also be given a type, which is useful since it can be used to customize the color of their label and the available custom properties for this object type. For tile objects, the type can be inherited from their tile. For most map types, objects are positioned in plain pixels. The only exception to this are isometric maps (not isometric staggered). For isometric maps, it was deemed useful to store their positions in a projected coordinate space. For this, the isometric tiles are assumed to represent projected squares with both sides equal to the tile height. If you’re using a different coordinate space for objects in your isometric game, you’ll need to convert these coordinates accordingly. The object width and height is also mostly stored in pixels. For isometric maps, all shape objects (rectangle, point, ellipse, polygon and polyline) are projected into the same coordinate space described above. This is based on the assumption that these objects are generally used to mark areas on the map. Image layers provide a way to quickly include a single image as foreground or background of your map. They are currently not so useful, because if you instead add the image as a Tileset and place it as a Tile Object, you gain the ability to freely scale and rotate the image. The only advantage of using an image layer is that it avoids selecting / dragging the image while using the Select Objects tool. However, since Tiled 1.1 this can also be achieved by locking the object layer containing the tile object you’d like to avoid interacting with. 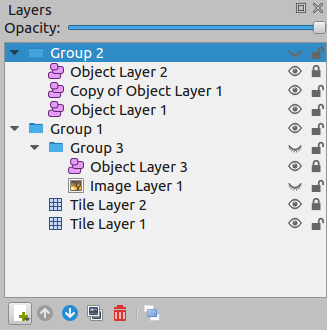 Group layers work like folders and can be used for organizing the layers into a hierarchy. This is mainly useful when your map contains a large amount of layers. The visibility, opacity, offset and lock of a group layer affects all child layers. Layers can be easily dragged in and out of groups with the mouse. The Raise Layer / Lower Layer actions also allow moving layers in and out of groups. Ability to lock individual objects (#828). Moving certain map-global properties to the Tile Layer (#149). It would be useful if one map could accommodate layers of different tile sizes and maybe even of different orientation. If you like any of these plans, please help me getting around to it faster by becoming a patron. The more support I receive the more time I can afford to spend improving Tiled! © Copyright 2019, Tiled Documentation Writers Revision 8a962188.